Waikiki Beach Walk is now home to nightly Ohana concerts by new and established artists. The shows, taking place in the area's plaza, are free to local residents and visitors from 5 to 7 p.m. in the plaza. » Lukini Duo: Features Gaylord Glushenko and Guitar Institute of Hawaii's Mike Barques performing songs from Hawaii's past and present. On Jan. 27, 29; Feb. 10 and 12. » Ualei: Kapono Haynes and Ku Souza, both graduates of the University of Hawaii's Hawaiian Studies program, perform original songs. On Jan. 23 and 30; Feb. 6 and 13. » Elena Martinez and Wayne Shishido: Jan. 24 and 31; Feb. 7 and 14. » Nihoa Duo: Andrei Puchert and Mike Barques perform original and contemporary songs in Hawaiian falsetto style. On Feb. 1. » Keith and Carmen Haugen: Hula and stories reflect the duo's knowledge of Hawaii's culture and lore. On Jan. 26; Feb. 2 and 9. » Greg and Junko MacDonald: Perform classic and contemporary Hawaiian music through the beat of the steel pans. On Jan. 25; Feb. 8 and 15. » Joe Wilcox and Robert Keliihoomalu: Duo shares its contemporary interpretation of traditional Hawaiian songs. Today and Jan. 28; Feb. 4, and 11. » Halau Hula with Blaine Kia: Traditional Hawaiian blessing will be followed by song and dance. Tomorrow and Feb. 5. » Wayne Shishido: Shares the stage with guest musicians such as Dr. Isaac Akuna, Kamaka Tom, Kaouiokalani, Derrick Kam, Tau Grieg and more, along with the sweet harmony of the Kila Brothers. On Feb. 3. 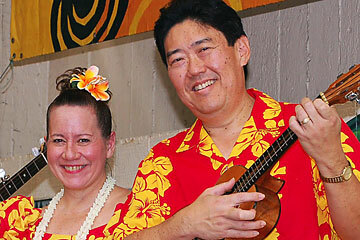 Elena Martinez and Wayne Shishido perform at the Waikiki Beach Walk on Jan. 24 and 31 and Feb. 7 and 14. The Ritz-Carlton, Kapalua on Maui, will start a $95 million renovation project, tentatively scheduled to begin on July 2, with completion by the 2007 holiday season. Changes will include new amenities, enhanced food and beverage outlets, upgrades and expansion to The Spa, additional activities for children and teenagers, 363 renovated guestrooms and 107 one and two-bedroom full-ownership Residential Suites, which will also be available to hotel guests. For information or reservations, call direct at (808)-669-6200, or (800)-262-8440, or visit www.ritzcarlton.com.